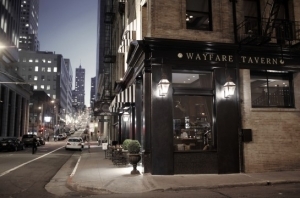 Tyler Florence's San Francisco restaurant, Wayfare Tavern, is not for the faint of heart. If your doctor has recently increased your cholesterol medication; if he has extolled the virtues of raw corn bran and advised you to seek out sprouted wheat; if he's prescribed more real exercise and less armchair quarterbacking – this restaurant may not be for you. Wayfare Tavern* is a bold restaurant with big flavors, good-sized portions, and enough butter to permanently clog a vegan's arteries. Restaurant owner Tyler Florence is better known for his presence on Food Network. He's also published multiple cook books and he owns a small luxury kitchen supply store, the Tyler Florence Shop, in Mill Valley, Calif. He opened Wayfare Tavern in June of 2010 in the space previously occupied by long-time restaurant, Rubicon. According to the website, Wayfare Tavern features "authentic American dishes inspired by local cuisine at the turn of the 20th century." I couldn't attest to that, not having been around in the early 1900s, but to my thinking the architecture and design suggest that time period more than the food does. With its dark, carved wood and stuffed animals mounted on the walls, the space might easily conjure up the atmosphere of San Francisco in the gold-rush boom. By contrast, I thought the food was decidedly more contemporary (if not exactly modernist). Julie and I walked to the restaurant from Sir Francis Drake, our hotel on Union Square. Walking seemed like the appropriate mode of transportation to a place called Wayfare Tavern. (We were, after all, wayfarers.) We arrived early and were seated immediately, despite the restaurant being quite busy. Our small table at the back had a nice view out into the restaurant for watching people and activity in the kitchen. The service, if not memorable, was fine. Our waitress seemed a bit nervous, but she was perfectly competent. The place was lively and noisy, but not overly so. Where we sat, we could comfortably carry on a conversation. The food was mostly good – at times great, at other times okay. Rather than bread, patrons are served popovers straight from the oven. And yes, they were crazy good. Of course I slathered mine with butter, because I rather like gilded lilies. We both had caesar salad, which I thought was an interesting but ultimately unsuccessful spin on the formula. It was essentially a deconstructed salad, each element separated out, as if for the diner to reconstruct. Each plate contained intact hearts of romain, whole roasted cloves of garlic, whole white anchovies, a small pile of herbs, and a light dressing. Again, interesting. But kind of odd. Julie had petrale sole in a chowder broth with clams, bacon and butter, and it was tasty and quite rich. I had grilled rib eye, dry aged, and it was spectacular. The flavor of the steak and its tenderness were as good as any I've ever had. The sauce and vegetables that accompanied it were rich (remember that I mentioned something about butter?) and delicious. That plate was ridiculously good. For dessert we split a chocolate cream pie. Neither of us was hungry at that point – and yet, we had to try it. Chocolate cream pie is one of my favorites, and the restaurant is known for it. This one? It was okay. I used to make chocolate cream pie when I was a pastry chef for Paragary's in Sacramento, so I may be hard to please. Overall, I thought it was a solid effort. Not stellar, but solid. The price, including tip, tax, and wine, came to $220 for two of us. In other words, it was not inexpensive. 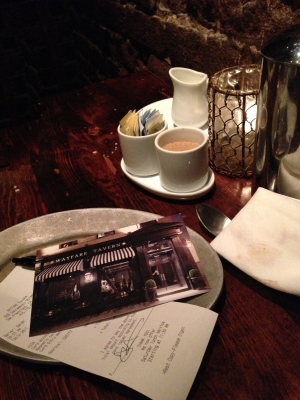 And for just a bit more, Julie and I had dinner a few weeks back at Redd in Yountville, which was unbelievably good. Fantastically good in every way. Redd is an A or A+. I'd give Wayfare Tavern a B, verging on B+. I would be tempted to say it was better than that, but when you drop two bills for a meal you want the experience to be extraordinary, which it wasn't. * Note: Photo borrowed from the Wayfare Tavern website.